Time being, color will be to be determined later. I tried to draw a picture as the left, to be able to decompose to each separate color block. This picture is separated to three colors wood blocks, is yellow-block, black-block, yellow/red-block. 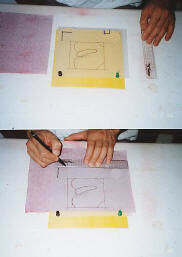 In the multi(separate)-color woodcut method, trace the picture by the tracing film. The first, Place the tracing film on top of the picture and fastened with scotch tape etc. Then, trace the outline of the picture. So that the outline does not become heavy, use pencil (about 2H) or sharp pencil. 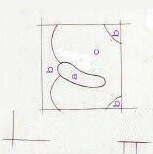 As Shown in the figure above, trace the picture to tracing-film. This picture is decomposed into three blocks. 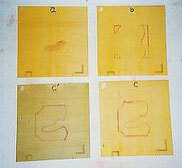 I marked a, b, c, as easy to understand at transfer to the woodblock. Two marks on the block "Kento"
"Kento" is used in determining the position of the paper on the block. Usually each block in making a print has a key-mark "Kagikento" and a straight-line mark "Hikitsuke kento". These are made in the shape of an L in the lower righthand corner, and a straight-line mark "Hikitsuke kento" at the lower lefthand corner. Basically "Kento" is marked at a distance of 3cm ~ 4cm from the picture, on the long side of the picture. Basically, to ensure that grain of woodblock is in the transverse direction. Tracing-film is pinned on woodblocks in the inside out, as registry mark "Kento” is to come to the front (toward you). And sandwiched between carbon-paper between the tracing-film and woodblocks. Transfer each of the color-blocks (a, b, c) to each of the woodblocks. So that the outline does not become heavy, use pencil (about 2H) or sharp pencil. Transfer "Kento" Accurately using a ruler.